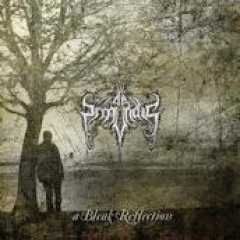 Having albums like De Profundis' "A Bleak Reflection" and Triptykon's "Eparistera Daimones" to review is like a football manager having four forwards in goalscoring form: not something you wish to complain about it but it can cause a few headaches getting the problems sorted. These two recently issued albums having been crying out for review for ages, and I'm going to start with the sophomore album of Londoners De Profundis, a band I recently saw live for the first time at Infernal Damnation VII and whom impressed me mightily with their technically complex fusion of doom, black and death metal that night. At 8 songs and 69 minutes, De Profundis produce protracted statements of intent with their music, weaving majestic intricately woven passages of slow Opeth-ian metal into packages topping 8 minutes on most occasions, all encasing a huge range of riffs and movements within each. Come the end of the closing track, 11-minute "The Mourner", you are guaranteed to feel a sense of pride at having lasted the journey, and quite possibly a sense of bewilderment at the passion and artistic craft that must've gone into the albums' making for what is bound to be very limited reward. I mentioned Confessor in reference to De Profundis in my live review and their staccato structures, in conjunction with Opeth's raw feel and dramatic song structures, and My Dying Bride's feeling of bleakness goes some way to describing tracks like "Ablaze In Autumn's Fire" and "Cold Is The Grave". Where lead guitars forge their own route, the bass is fingered in an unusually funky and apparent fashion and Craig Land bellows out his lungs De Profundis sound a band expertly crafted in this progressive extreme metal field, belying the fact this is only the band's second album. Most of this album's procession is of a gentle, slow-mid paced one, following on from the introductory track, "The Ephemeral Burden", which for once feels connected to what follows and not just a piece of soft piano slapped before bludgeoning thrash/death metal riffs. "Nocturnal Splendour" is the band's moment to let loose and show they are no one trick pony, as the backbone of biting black and death riffs sits with greater accuracy with Land's hoarse vocals and yet which at all times feels laboriously constructed in comparison to most other bands within the genre. Land's tones, for the most part raw growls akin to Mikael Åkerfeldt’s are not initially a comfortable fit with the music as great that the growls are the progression overtones throughout could be better served with moments of clean vocals as well. Perhaps in my world-weary ways repeated listens have nullified this problem to the point where I feel they now play together happily, taking the atmosphere that bit further downwards into classic My Dying Bride territory, which is never a bad thing. This really is a very good album and one that I'm pleased has come to my attention. To hone their craft further would only involve suggesting greater vocal variation and ever more divinely engaging songs, but in this instance De Profundis have left little room for improvement such is the perfectly weighted production job and genuine artistic endeavour in every detail of the record. If you're looking for a 'challenging' metal record of the year I think we've just found it in "A Bleak Reflection".